The Mexican peninsula which is Baja California, separates the Pacific Ocean from the Sea of Cortez. One of the youngest seas - its formation beginning 25 million years ago - the Sea of Cortez is one of the world's largest really deep gulfs. 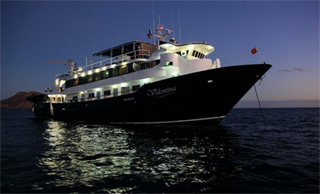 A profusion of marine-life and some spectacular scenery make the diving in Baja fantastic. The Sea of Cortez is one of the most fertile seas in the world. Cold water upwellings - when cold, deep-water, currents collide with underwater peaks and are forced upward - bring with them nutrients from the depths to mix with the oxygen-rich surface water. Also known as the Gulf of California, the sea is home to an immense variety of species, from tropical creatures in the south to cold water ones in the north. In 1900 John Steinbeck and Ed Rickets surveyed the Sea of Cortez, discovering dozens of new species and documenting ecological details. This resulted in Steinbeck's classic book Log from the Sea of Cortez. For more information on diving in Baja California, please browse through the Baja topics on the left. We also welcome your views and experiences - fill in our form. This famous dive, at the southerly tip of the Baja California peninsula, is unlike any other. At depths sand cascades down the rock forming the titular sand falls. A series of crevasses and abysses run parallel to the shore, mirroring the cliffs above water. The sand at first slopes gently down but at 8 m takes a steep turn. Gullies lead downwards below you. At 25 m you find the top of a cliff, deeper and you hang at the side of it with nothing beneath you. Sea fans decorate the cliff and shoals of chromis join you. The only true coral reef in Baja is at Cabo Pulmo, but we consider the best dive to be not over the coral but on a rocky reef out to sea. This reef is around 300 m long. Depending on the current, and how slowly you try to traverse it, you can spend around 20-55 minutes. The visibility is generally good. With a gentle current the dive begins with a garden of eels. Big, tight shoals of fish move over the reef - much more compact than you see elsewhere. 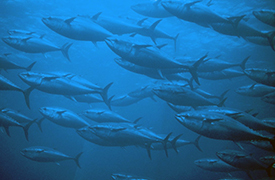 Large schools of tuna swim overhead. A strong current makes for an excellent drift dive. The fish frantically zip about, swimming easily against the current. This time the schools are loose and spread out. You don't just see fish of course; coral, sea fans, starfish, crabs, and other creatures are all here too. Another fantastic dive, but you have to be lucky with the conditions. The current here is unpredictable and if strong detracts a lot from the enjoyment. On good dives, you descend into a cloud of small wrasse, just inches from your mask. Typically of Baja, a multitude of fish live on the mount. Large shoals of jacks hang off it, and hammerhead sharks lurk around it. In late summer and early autumn look for manta rays. El Bajo is a submerged group of 3 pinnacles lying in a North-South line. The top of the north pinnacle lies at 23 m, the middle pinnacle at 17 m and the south at 20 m. The middle one is the largest and bottoms at 29 m. Its south side is a steep cliff. Take a southerly bearing from here and you can swim to the south pinnacle. You can see it if you stay close to the bottom, but the bottom slopes off downwards. Be very careful about the current: it's very easy to drift off. The south pinnacle is home to a clutch of large green moray eels, about 7 in 1 gully. The sea temperatures from La Paz south are 21 to 29 oC all year round. The visibility is best from July to October. November to March has the coldest water. To see whale sharks you need to go during algal blooms in Spring and Autumn. Manta rays and schooling hammerheads arrive during late summer and early autumn. Cabo San Lucas has a recompression chamber available 24 hours a day. Our thanks to Gordon Philippe for these comments on getting about.
" We would recommend renting a car to get to all the beaches but haggling to get the type of car you pre-booked, reasonable rental rates, and refuelling are all art forms. Our recommendation would be the air conditioned, standard shift, Volkswagen Pointer. It is like a scaled down Passat wagon and great for all the terrain one will encounter. Plan travel during solid day light hours as hundreds of cows move onto the highways at dusk to graze the roadside vegetation. If caught out driving past dusk going slow is not considered being chicken or dodderly. You are always smart to let someone else pass you and clear the cows for you. It is the only time when speedy drivers don't have the desire to pass." Pesos or US dollars are equally accepted, as are dollars travellers cheques. You can pay in supermarkets in travellers cheques and get pesos in return: the exchange rate works out the same as the banks. Some places charge more though, if you pay in dollars. Also, some places impose a surcharge for paying with credit cards. The banks don't charge commission for changing dollars, cash or travellers cheques.